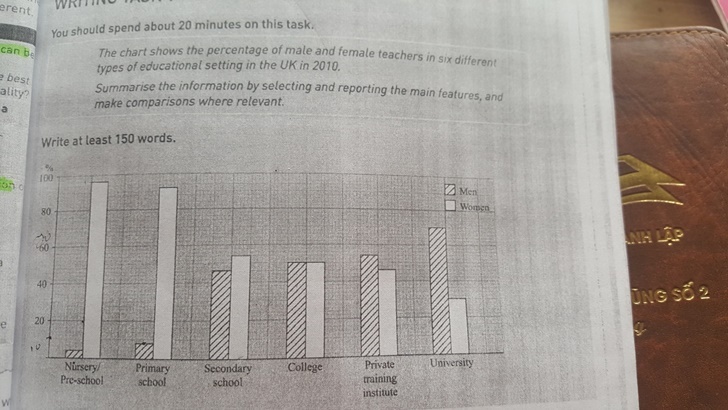 The Chart Shows The Percentage Of Male And Female Teachers In Six Different Types Of Educational Setting In The UK In 2010? These are not common words in England or the rest of the UK. Many people will be unfamiliar with them. It would be better to replace them with more common words. The meaning of this is unclear. You should explain it. are rare and antiquated words in the UK. It's possible that they are still used in private schools but, they are not used in general. It would be better to replace them with the word teacher. Firstly , thank u so so much for helping me. I'm so grateful. This is the picture of full task . So can u help me correct it more and replace wrong words with much better words . Don't leave a space before punctuation. Based on your photo, it's clear that you need to write decreased instead. The red part is not needed. This would be better as male teachers. You need a instead of an. Ha Quynh Huong especially it makes up over 70 % . Don't leave a space before the percentage sign or the full stop. The red part is not needed. I think my paragraph is not clear and informative enough to get high scores in IELTS exam.So Can u add some sentences to make it much better? Different Types Of Contact Lens..?